A charming couple in Ottawa, Canada, Chrys and Dom Coballe, is making some handsome, if expensive, iPod Nano watch bands that pop out and even turn at an angle to offer multiple viewing angles. 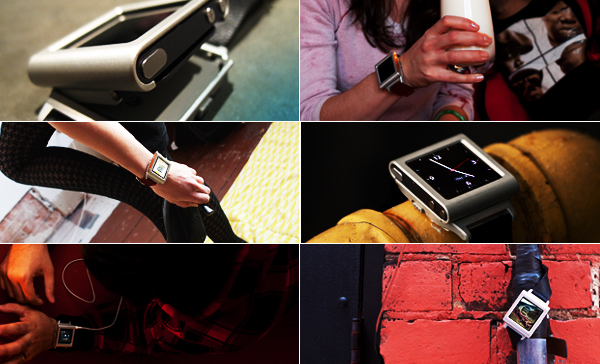 Although I think the hey day of the iPod Nano watch is over, they seem far too charming to just ignore. The product, called the Deckster, is made of metal and leather and costs $125 to pre-order on Kickstarter-like CKIE. For $500 you can have dinner with the couple in Ottawa or Montreal or “Or an equally enjoyable Skype chat if you’re not nearby.” There’s no telling how wild things can get if you submit $1,000 or more. Regardless, I’ve seen a lot of iPod Nano watch bands in my day and I’m not sure I’m amazed by any of them but this one looks acceptably solid and usable.